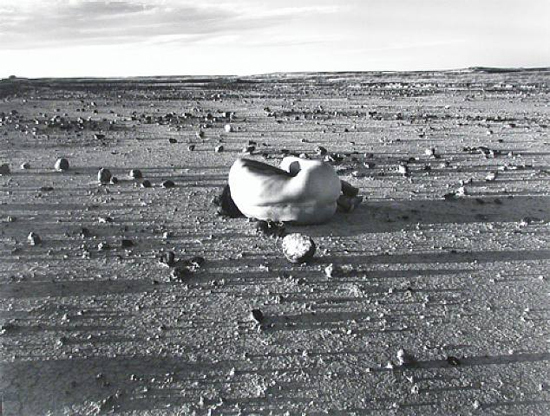 I couldn’t find Judy Dater’s self-portrait referenced at the beginning of this but I found another of her self-portraits. 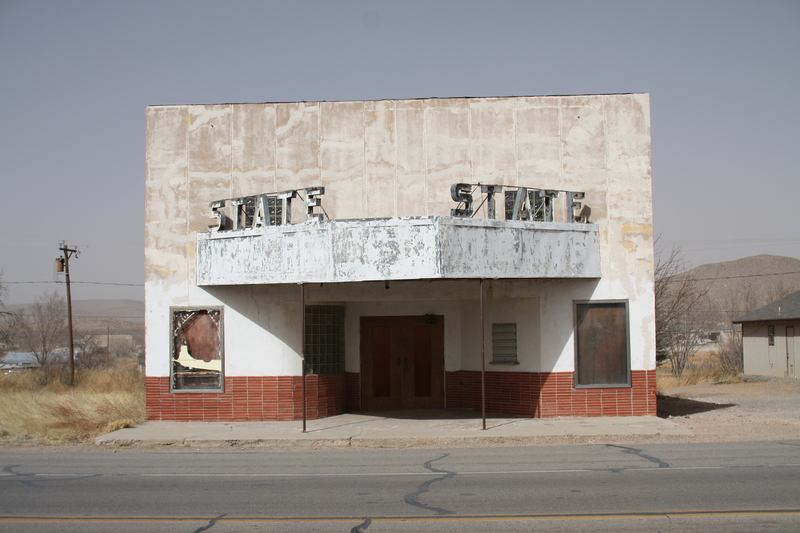 This weekend my grandma and I went to Marfa, TX (just a little southeast of El Paso). 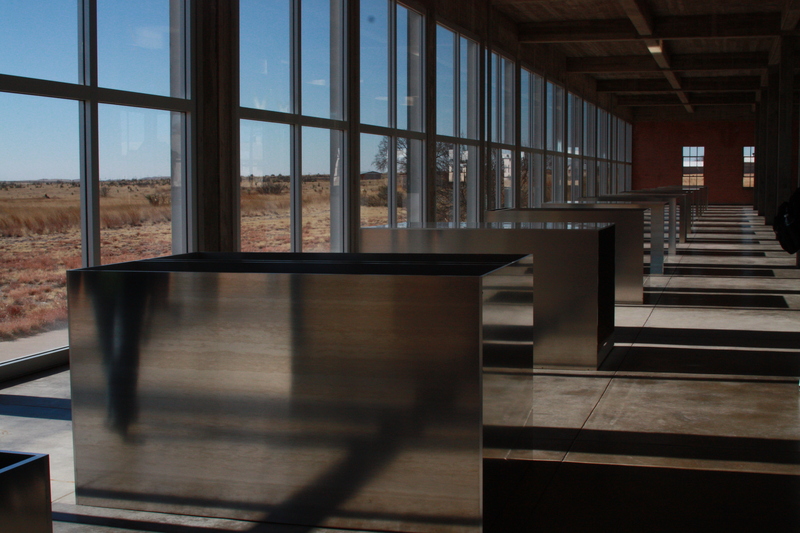 We didn’t see the Marfa lights but we did visit the Chinati Foundation, the contemporary art museum started by Donald Judd. 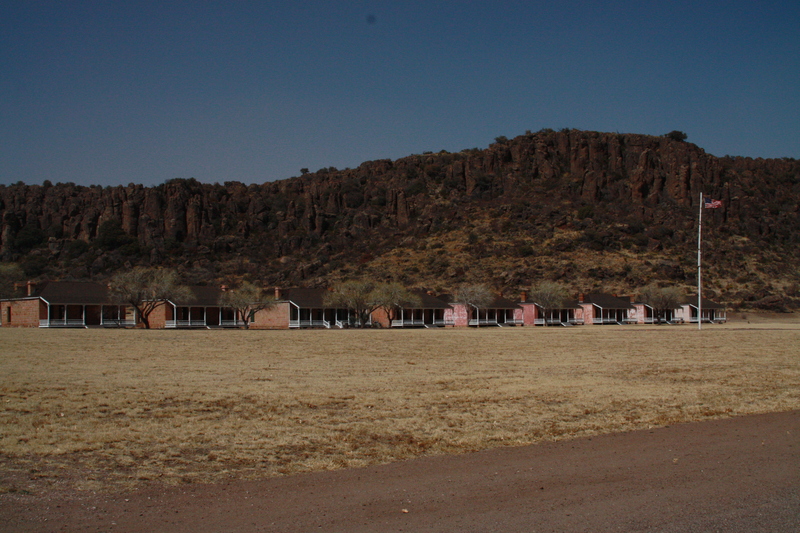 The museum is on an old fort so all of the work is spread out into different buildings. 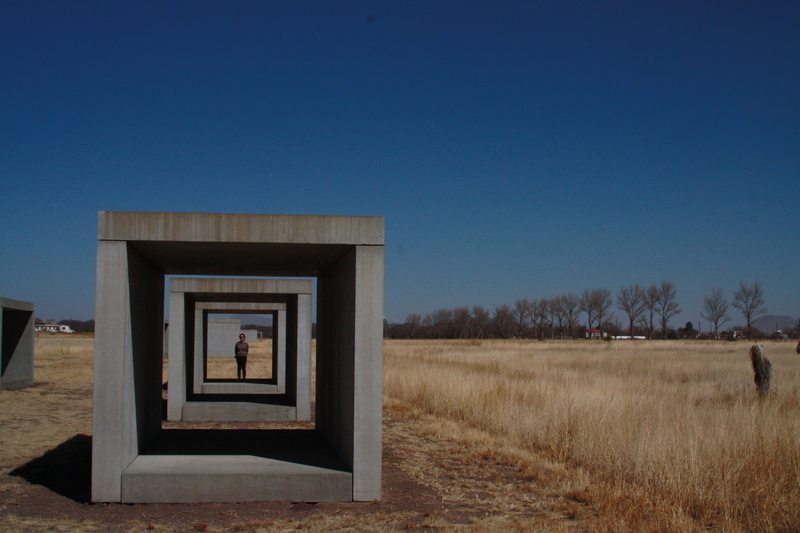 The museums’s intention is to show large-scale installation pieces that demonstrate the link between artwork and the surrounding landscape. For this reason all but one of the pieces are permanent. A piece is made for a particular space and should remain there as long as it exists. Marfa was interesting. 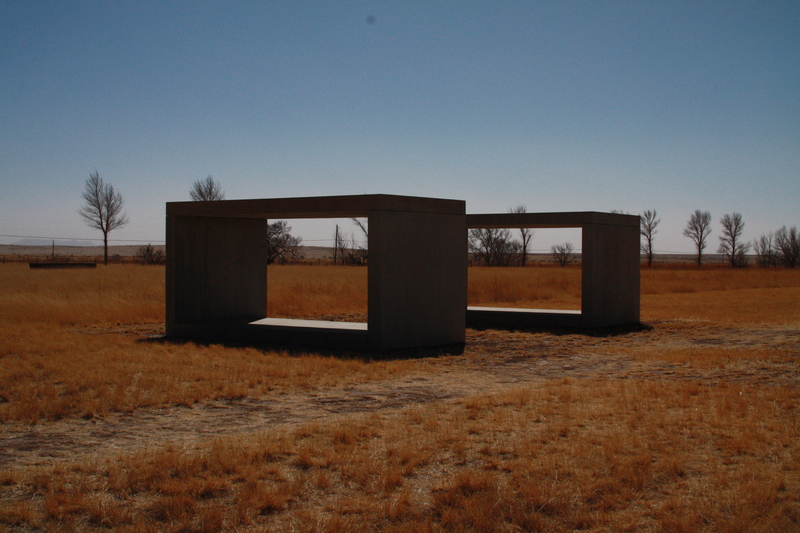 The entire town seemed to have taken on the minimalist ideas of Judd. 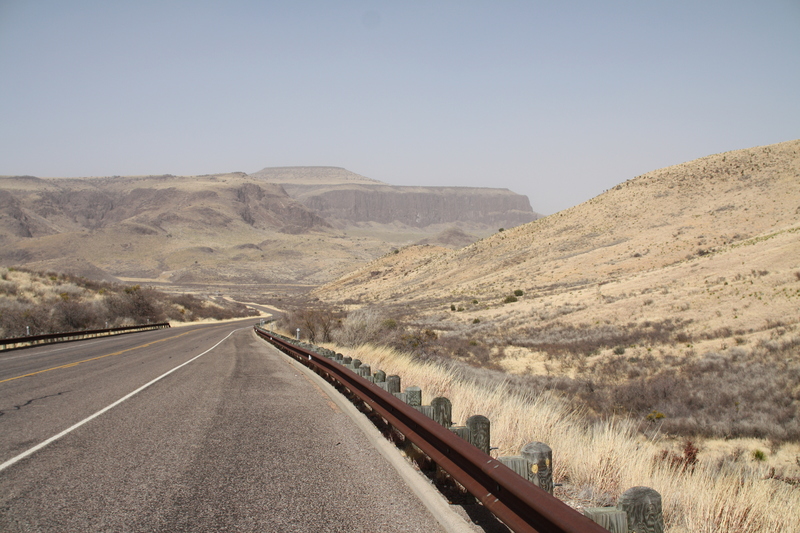 Then we continued to Fort Davis, where we were nearly blown away. The wind was unbelievable. Tumbleweeds and dust were flying everywhere. So we drove north through the Davis Mountains. It was amazing. The rocky cliffs looked like dolls watching us from the road. This another piece I’ve been working on. I’ve been going on short hikes behind the cabin and collecting different treasures I find. I’ve found some amazing insects that are perfectly preserved and dry. I also have so many rocks you wouldn’t believe it. It’s just like when I was a kid and called the little black rocks “dog noses.” After I bring everything back I identify it and put it in a jar. 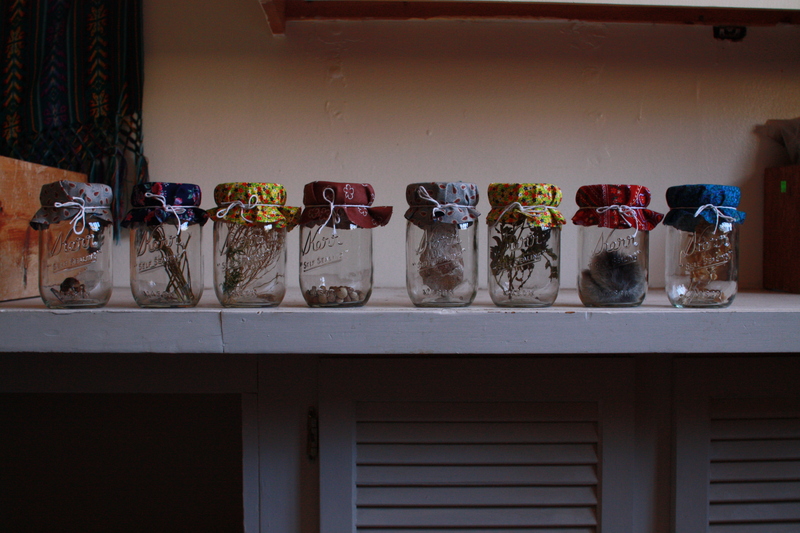 Each jar will have a label when I’m finished. I thought I’d also put this picture up because its so funny. 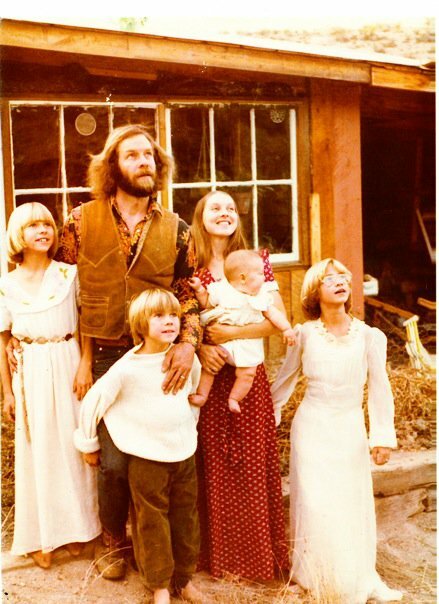 This is my grandparents and all the kids at the cabin. My mom is the one on the far right. It’s interesting staying here because there is so much of my family history preserved here. The bar that my grandparents owned is right down the road as well. In the piece above I was thinking about this preservation of the natural environment as well as my family’s stories. This is the piece I’ve been working on. I’m just about finished. Its sort of another interpretation of the Organ Mountains. I’ve started driving around Las Cruces and the only way I know where I’m going is by looking for the mountains. I also went on a hike today with my grandparents, looking for petroglyphs that we heard about near Tonuco Peak. We didn’t find any petroglyphs but we did find lots of rocks and bones and even some rabbit tails… I’ve been thinking about how well things are preserved in the desert, freezing time. I have some ideas for an additional work…I’ll post some photos as that develops. Anyways, lunch in Hatch for world famous green chile and barbecue was delicious! This weekend I’ll be in Silver City and Deming. I’m here! I’ve actually been here for two nights but have just figured out the internet situation. This is the little house that my grandparents built in 1976. The first night was interesting…getting used to being alone in the quiet. I have many memories of Radium Springs, shaped by visits to my grandparents’ other house and the stories I’ve heard about growing up in this distant place. This was the first time I drove myself out here, every other trip was seen from the backseat. I realized that this project, for me, is going to be a lot about home and origin and the landscape to which one belongs. I’m returning to New Mexico to study and to navigate and map my home. These are the pieces I’ve been working on in preparation for my trip to Radium Springs, NM. I’ve been looking at the topography of the areas I will be near. I also read Desert Quartet by Terry Tempest Williams, in which the author describes the eroticism and energy of the desert. The bottom piece began as a study of the Organ Mountains in Las Cruces and I presented it in critique as still in process. I was pleased to hear that in this piece my peers saw maps, home, and a female figure. We also discussed it’s formal similarities to the Venus of Willendorf as well as its vaginal qualities. The top piece is the rough shape of the Chihuahuan desert combined with images of organs and life which I have been playing with for a while. 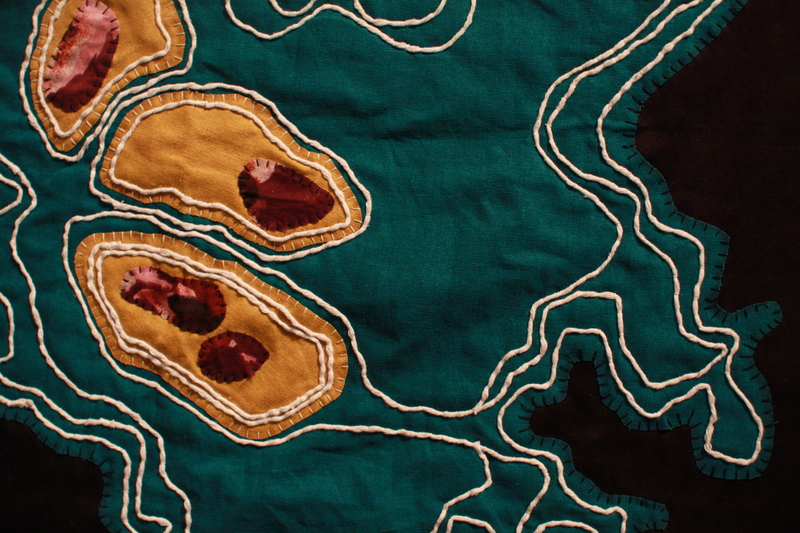 I’m interested in how this piece was interpreted as a map of large area as well as a view of microscopic organism.